Monitor lead microHDMI plug to standard full size HDMI plug. 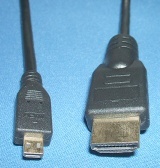 Cable suitable for connecting equipment with a micro HDMI output socket (such as some media servers) to a HDMI input monitor/TV. Price: £8.00 no VAT to pay!